Cobra Triangle is one of Rare’s more fondly remembered NES outings, and it isn’t too difficult to see why. Though at first glance it may appear to be little more than a boat racing game, Cobra Triangle quickly proves itself to be a game of surprising variety. The first stage of Cobra Triangle is wonderfully deceiving, being a racetrack you may have predicted from the game’s artwork, with controls that are eerily similar to R.C. Pro-Am’s, albeit with a boat instead of remote controlled cars. Your boat also has the benefit of having projectile missiles equipped at all times, as opposed to Pro-Am’s weapons being power-ups. Once you finish that first race, however, the game starts throwing curveballs at the player through stages that have varying objectives. Soon you’ll be defusing water mines, fighting massive sea monsters, collecting items, and saving swimmers, among other goals. There are twenty-five stages total, with some stages trading places depending on which paths you decide to take in the racing courses. The sheer variety of ways Cobra Triangle creates with such seemingly simple gameplay is the highlight of the package. As far as NES games go, few titles in the 8-bit console’s library could boast such versatility. If there is a notable complaint to be found, it’s that the aforementioned “swimmer rescuing” missions are considerably more difficult than the rest of the game, to the point of being frustrating. Enemy ships will come charging at the poor swimmers like bats out of Hell, and your boat isn’t fast enough to keep up with them all. Add in enemy missiles that temporarily stun you, and things get downright stressful. Granted, there only needs to be one swimmer remaining in order to move on to the next stage, but that is much easier said than done (especially when you consider that your thumb might be exhausted, as you have to repeatedly press the attack button to continue firing missiles instead of simply holding it). While the rescue missions may drain your lives quickly, the rest of the game provides a steep but reasonable challenge. And once a level’s goal has been met, your boat grows a helicopter propeller and flies to the next stage. How cool is that?! Cobra Triangle also made the best of its 8-bit limitations with vehicle (and monster) sprites that were really impressive for their time. Like a number of Rare’s other early titles, the game is played in an isometric view, which can admittedly lead to some tricky perspectives at times (such as when trying to collect items when jumping off ramps). But from a technical standpoint, the graphics remain impressive for how there can be so much going on on-screen, yet it can manage to keep up with the action of your ship without any notable graphical hiccups. On top of all that, Cobra Triangle also features a catchy soundtrack by none other than David Wise. Though it may not have the same depth or atmosphere as Wise’s later scores, the acclaimed gaming composer does help bring out Cobra Triangle’s unique charm through its soundtrack. Cobra Triangle remains a fun game to play today, which is quite impressive for something that, on the surface, may just appear to be an NES boat racing game. The rescue missions may break the pacing of the game a bit with their considerably difficulty spike, and the perspectives can be a little misleading at times. 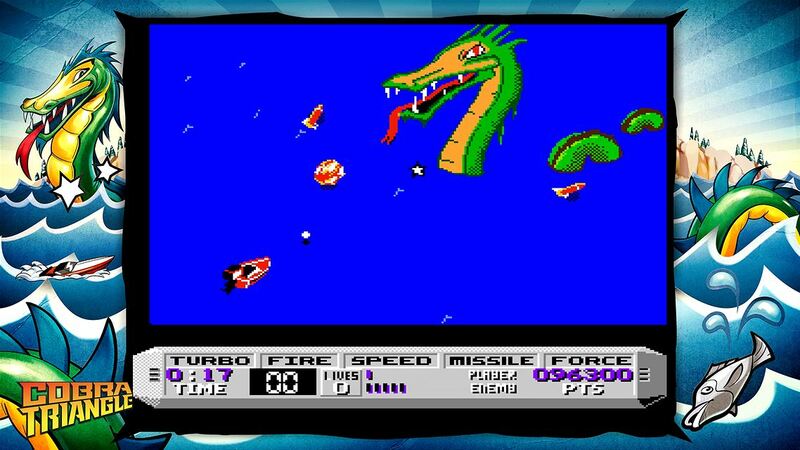 But there’s no denying the fun, variety and ambition that Cobra Triangle brought to the NES.